These gloves are too presh! Saw a picture of something like these online and decided we needed to make them. I'll be honest, this isn't the easiest tutorial I've ever done. 1. Cut out 2 hearts from the felt. 2. Tear the paper in half and roll up each piece. Put the pieces inside of the gloves so the glue doesn't seap through. Cover a side of the felt heart with glue. 3. 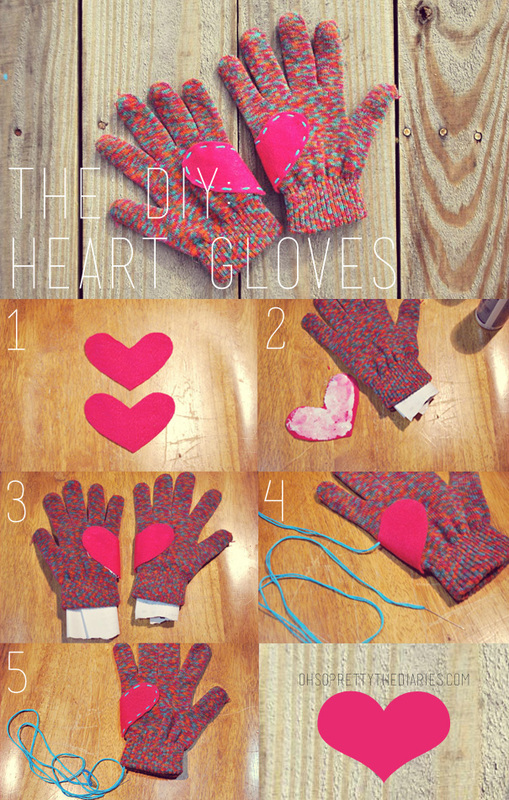 Place the heart on the side of the gloves away from the thumb. Line up the center of the heart with the edge of the gloves. Let dry. 4.This is the hard part. Start stitching from the inside of the glove. 5. Stitch along the edge of the heart. Be careful to not stitch the sides of the gloves together. So cute! You can make these with whatever color gloves, felt and thread you want. Must rememeber to do this for Winter!!! So going to try this out next week !